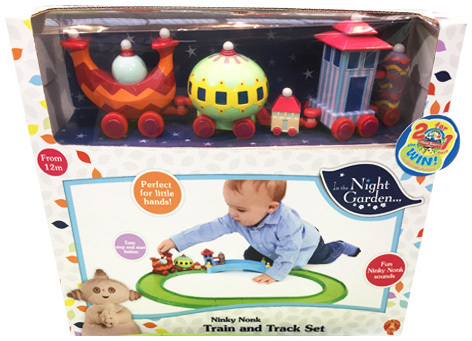 Building on the huge success of their In The Night Garden products, Golden Bear launched the Ninky Nonk Train and Track Set. Perfectly designed for the smallest hands, this toy is suitable for children as young as 12 months old. A green oval track with a little blue bridge for the train to run along is easy to assemble and gives hours of fun. The train comprises of five sections including the banana shaped engine and trucks. An easy-to-press button on top of the engine turns the train on or off. This delightful set will amuse all the fans of Igglepiggle and this enchanting show, especially when they realise that the train also makes lots of familiar Ninky Nonk sounds! Please tell us what you think of the Ninky Nonk Train and Track Set by Golden Bear.